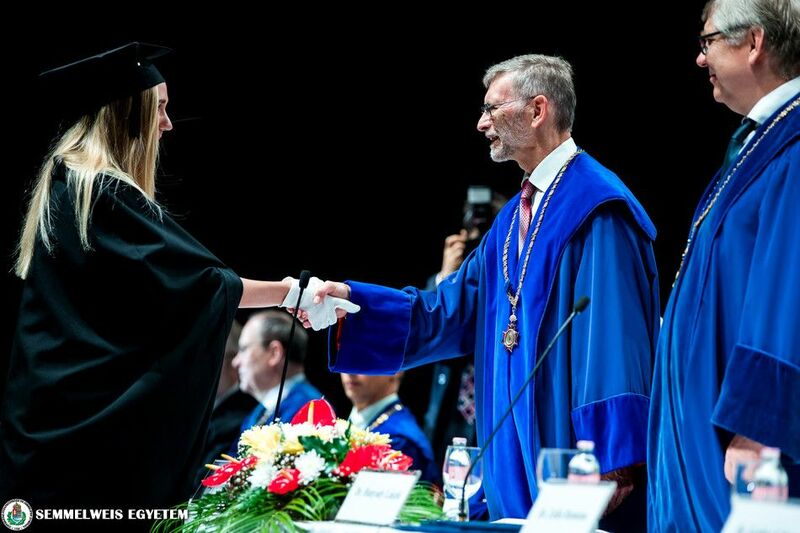 After taking their solemn oath, the medical students were given the degree of Doctor of Medicine by Dr. György Bagdy, Vice-Rector for Scientific Affairs and Dr. László Hunyady, Dean in the Papp László Budapest Sportaréna. Altogether 595 students finished this year, among them 237 foreign students from 27 countries of the world. 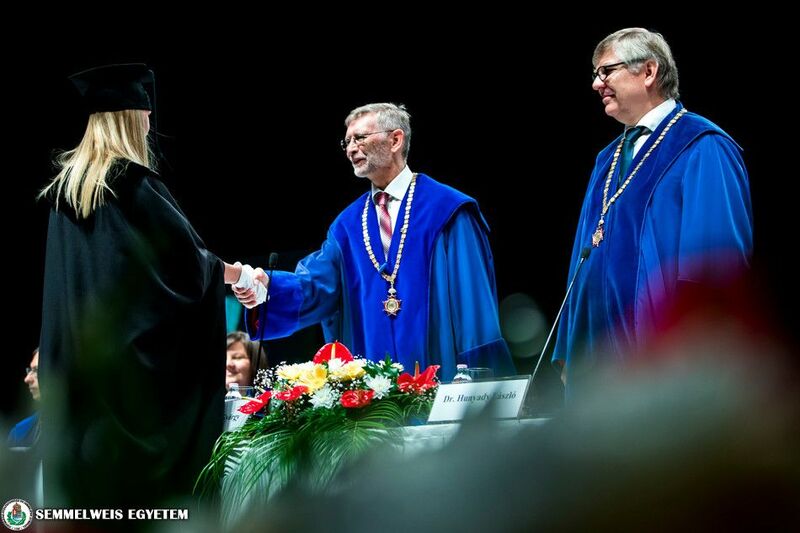 The Graduation Ceremony of the Faculty of Medicine was opened by Dr. György Bagdy, Vice-Rector for Scientific Affairs. 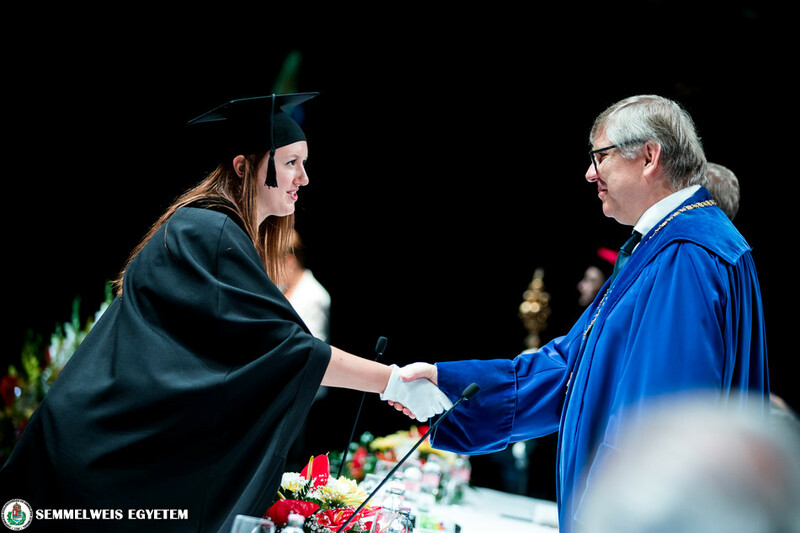 Afterwards, a graduating medical student, Orsolya Menyhárt officially submitted the conferment request. The graduating medical students then took their solemn oath that they would be doing their professional duty with the utmost diligence in every aspect. The solemn oath was taken in three languages: in Hungarian, English and German. Following the oath, the graduating students were conferred upon the degree of Doctor of Medicine by Dr. György Bagdy and Dr. László Hunyady. “Now we have officially provided you with the rights and responsibilities that all Doctors of Medicine legally have. We kindly ask you to please always remain loyal to the oath that you have taken in order to care for and heal patients, to accomplish all of your responsibilities and to do your professional duty with the utmost diligence.” – addressed the Vice-Rector for Scientific Affairs the freshly graduated Doctors of Medicine in his ceremonial speech. 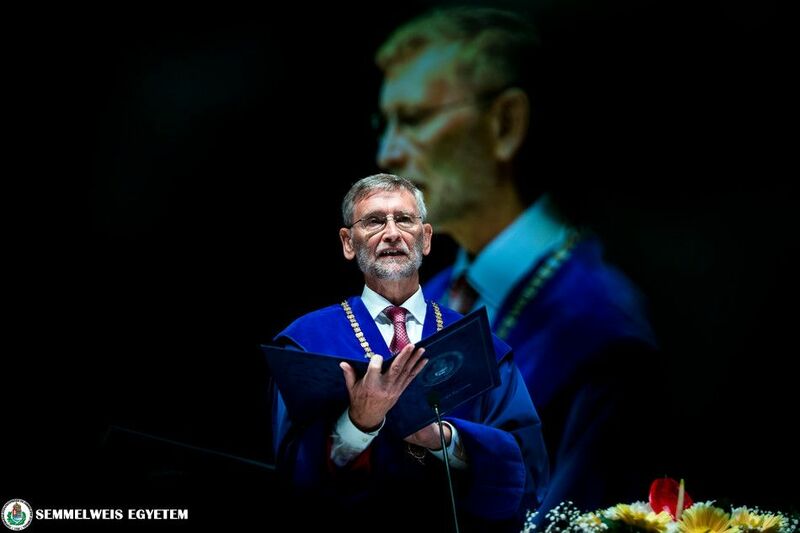 Dr. József Hajnes addressed the audience on behalf of the students graduating in the Hungarian language programme. At the beginning of his speech he commemorated Ignác Semmelweis who was born 200 years ago. On behalf of his co-students he thanked their families for the given support during their studies, he thanked the leaders of the university, the teachers for leading and inspiring them. He also talked about the importance of life-long learning, and about the preservation and development of skills such as open-mindedness, flexibility, creativity, innovative thinking and cooperation. On behalf of the students graduating in the German language programme, Dr. Robert Hedrich addressed the audience. 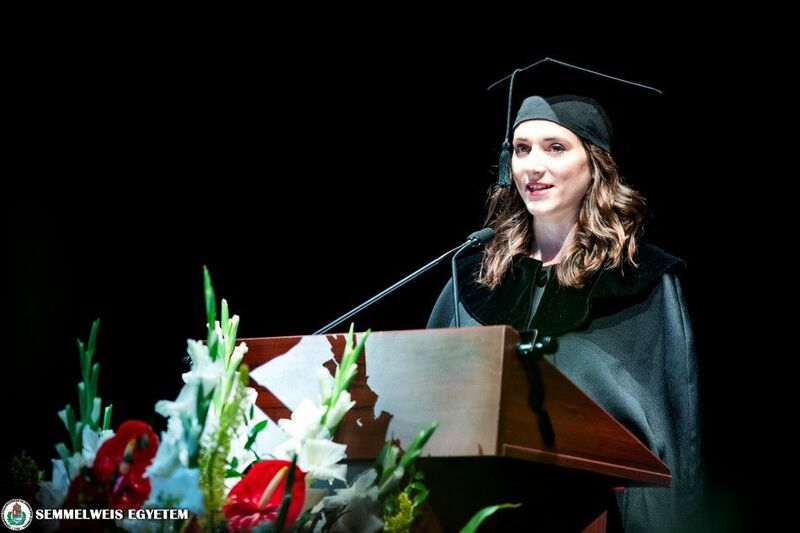 On behalf of the students graduating in the English language programme, Dr. Faisal Anum és Dr. Slotfeld Binca Mirella Fiorentino and Dr. Saeter Frode held a speech. They recalled their university years, the difficult challenges and the joy as well. 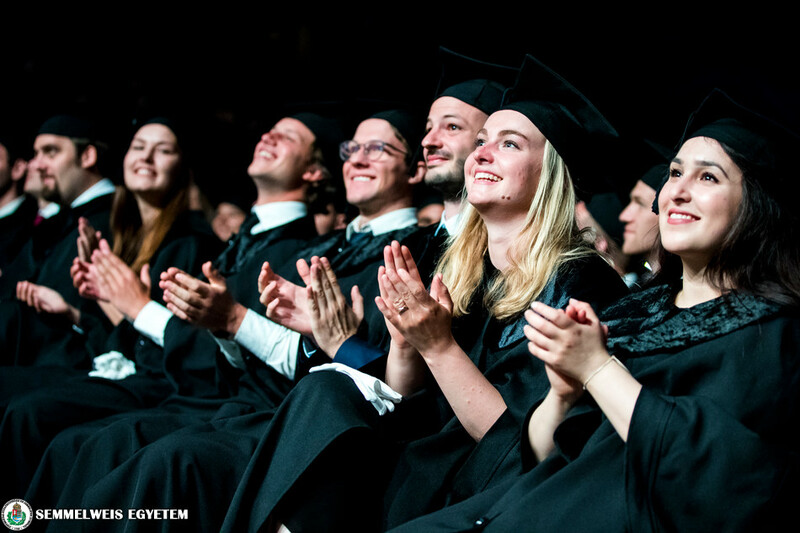 In his ceremonial speech at the 248th school year at the Faculty of Medicine of Semmelweis University, Dr. László Hunyady emphasized that this day is uplifting for the families and it also means joy and a feeling of success for the teachers. Talking to the freshly graduated Doctors of Medicine, he claimed that they deserved the medical degree after the hard work and perseverance of the past half a decade. He also said that this is a remarkable achievement as our university provides internationally acknowledged medical education that is based on scientific grounds. Dean Hunyady stated as an example that the university has a prestigious place in both the Hungarian and international rankings. The successful medical education is also represented by the high average of international students as 45 percent of the students takes place in the German or English language programme. 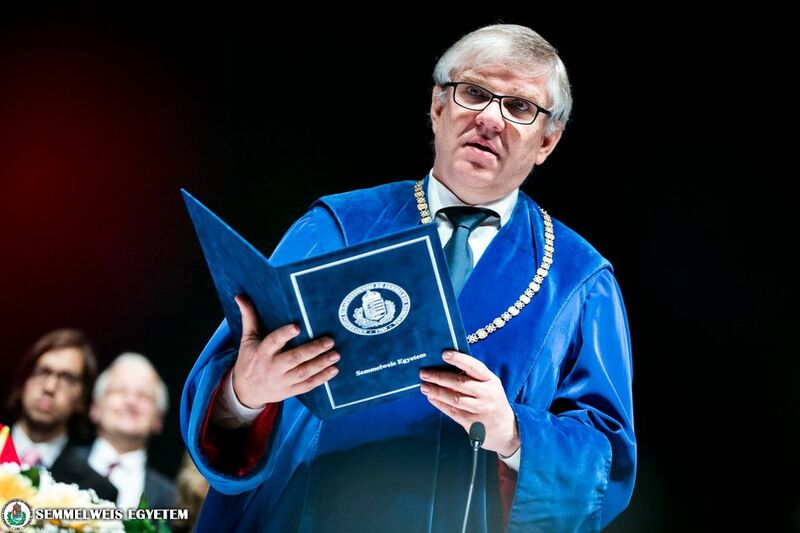 As Dean Hunyady sad, the fact that the Hungarian Government has recently indicated the intention of developing medical education several times is very joyful. He also highlighted that this can only be achieved by the parallel development of education, research and patient care. Among the prominent personalities, Ignác Semmelweis once the teacher at the Faculty and the denominator of our university, is the most enormous giant – said Dr. László Hunyady. He also added that we would celebrate the 200th birthday of the saviour of mothers and because of this occasion, 2018 was declared Semmelweis Memorial Year by the Hungarian government. As he explained, the tragedy of Semmelweis was caused because in that era his genial, scientifically supported theory could not be understood due to the lack of theoretical scientific knowledge. The microorganisms and their role in causing diseases were unknown at that time. According to Dr. László Hunyady, this points out the fact that theory and clinical practice are equally important. He emphasised that the message of Semmelweis’ story towards us is that the significance of knowledge based on science cannot be questioned by the scientifically unrealistic dogmas and solutions without a professional background. Dean Hunyady highlighted that Semmelweis’ other message was the importance of prevention. He favoured the work of the Budapest Medical Students’ Association, whose more than 500 members hold preventive and other health-related thousands of lectures yearly. 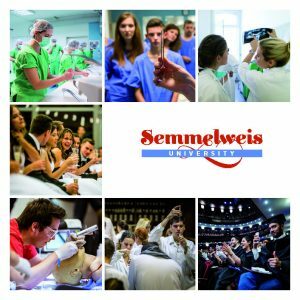 This year they organised the Semmelweis Health Education Competition for secondary school students for the third time. During the ceremony, Dr. József Hajnes, the ex-president of the Budapest Medical Students’ Association, was awarded the Silver Pro Universitate Award for his outstanding work in prevention and health education and organising the activity of the association. 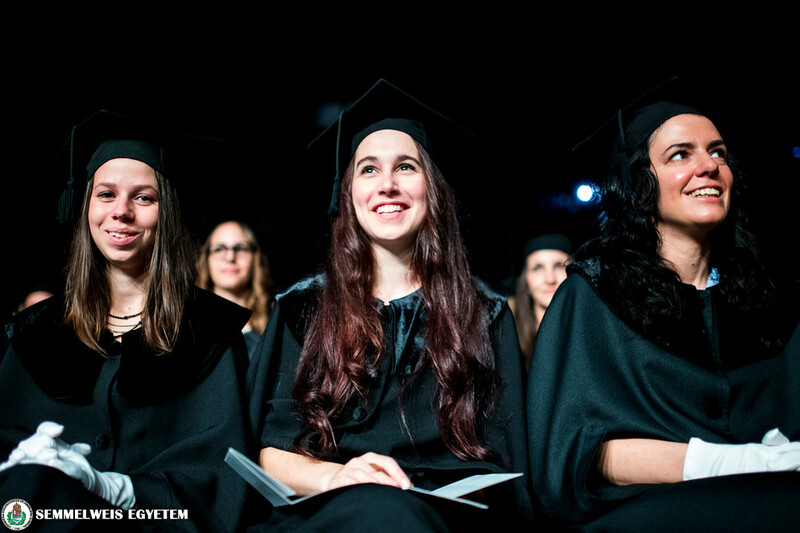 Dr. György Bagdy addressed the freshly graduated female doctors and explained how he had experienced that his mother had also taken her work seriously and had been on duty weekly. He claimed that he had heard a lot about the miracle of healing and had been very proud of her mother and had sympathised with her mother when somebody could not be saved at the department. These feelings might have been swirling in him when he had decided not to become a doctor. He also added that not only his mother but also his aunt, niece and daughter started their families with a medical diploma. Addressing the freshly graduated Doctors of Medicine, the vice-rector highlighted that they chose a beautiful profession where work and private life are not easy to split. Finally, Dr. Bagdy wished them to be able to overcome these difficulties as they overcame the exams. At the ceremony Dr. Hedrich Robert was given honorary diploma as he contributed outstanding effort in representing the students studying in German language, taking the interest of his co-students and the regulations of the university into consideration. Dr. István Boldizsár Soproni, the outgoing captain and the most technical player of the handball team of Semmelweis University was given the prize of the Sports Center.